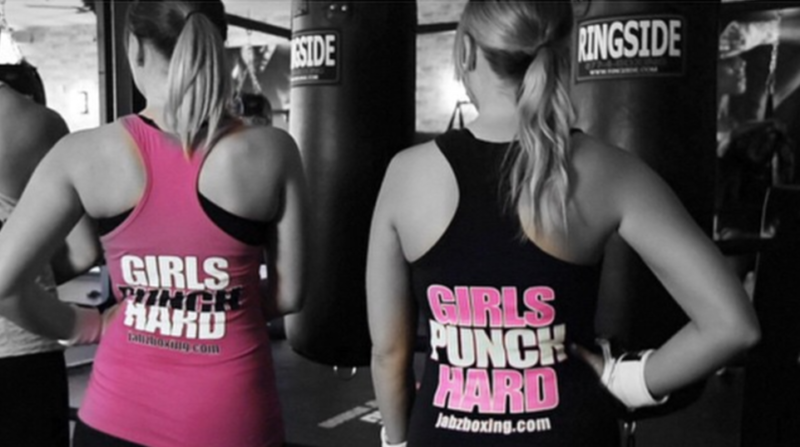 SCOTTSDALE, Ariz. – Jabz Boxing, a full-body circuit style workout utilizing boxing inspired exercises designed specifically for all women, announced today a franchising strategy that will expand its studios into key markets across the country. As the fitness studio concept continues to rapidly expand into key markets across the United States, Jabz Boxing is actively seeking qualified franchisees who are passionate about fitness and entrepreneurship to join its system and bring the Jabz culture of female empowerment to their local communities. “Our mission is to create a space where women can come together, get a great workout and empower each other to be their best selves. Jabz workouts are designed for women of all ages, body types and fitness levels, to reach maximum results. Our focus is developing fitness rather than fighters.” Kimberlee White, CEO and co-founder of Jabz Boxing said. “We are ready to take our local impact to the national stage,” added Len Hayko, President and co-founder. In order to make Jabz Boxing a heavy weight franchise champion, White and Hayko developed an advanced franchising plan and began growing the Jabz brand. Jabz Boxing currently has franchised 20 studios throughout Arizona and one location in the Philadelphia metro area. The concept’s impact on women has been so powerful that many current franchisees are former members or employees of Jabz. With a goal of rapidly expanding the brand, Jabz Boxing recently added a heavy hitter to its team by joining forces with ZGrowth Partners. Jabz Boxing and ZGrowth are slated to bring the franchising opportunity to new regions starting in 2019. The first Jabz Boxing studio opened in Scottsdale to an incredible response in 2012. White and Hayko launched the concept after identifying a need for boxing inspired exercises as part of a fitness workout geared towards women. Their instincts were correct – the studio quickly reached maximum membership capacity. Following Jabz Boxing’s first year in business, one of their members approached them asking if Jabz was franchising. Ideal franchisee candidates range from owner-operators with past business experience who are looking to be highly involved in their studios to multi-unit owners looking to develop a number of markets. Jabz Boxing currently has select franchise territory opportunities available in key markets across the United States. The overall investment to open a Jabz Boxing franchise location ranges from $99,245 to $194,380, which is nearly a third of the cost of traditional fitness franchise opportunities. Each studio acts as a community center to empower clients to achieve their fitness goals through challenging and fun workouts that allows clients to see fast results. In addition to having the full range of perks as an emerging franchise business, including access to leadership and dedicated training at Jabz University, franchisees are also given access to unparalleled support from the moment they enter the ring, including business planning, pre and post opening support, ongoing marketing and employee training. For additional information about the Jabz Boxing franchise opportunity, visit https://www.jabzboxing.com/own-a-jabz/ . Jabz Boxing, a full-body circuit style workout utilizing boxing inspired exercises designed specifically for all women. Our focus is on developing fitness rather than fighters. Our workouts combine cardio, strength training, core work, and plyometrics to help give clients a full body workout to maximize results and meet all of our client’s fitness needs. Jabz workouts change daily to help keep our client’s bodies constantly challenged and our Jabz certified trainers are prepared to help guide and motivate women of all different sizes, ages and body types though an energetic and intimate workout experience. Since it began franchising in 2013, Jabz Boxing has now grown to 20 franchise locations in Arizona and New Jersey. To learn more about Jabz Boxing, visit https://www.jabzboxing.com/ . To learn about franchising opportunities with Jabz Boxing, visit https://www.jabzboxing.com/own-a-jabz/. Partnering with Great Brands to Build World Class Franchise Systems. ZGrowth Partners is a consulting firm specializing in managing the franchise sales, operations and brand development of emerging franchise concepts. Through its private equity fund, ZGrowth Capital, our strength is focusing on investing in and growing differentiated franchise concepts with attractive unit-level economics. To learn more about ZGrowth, visit zgrowth.com.